They went on together, and as they passed a cherry-tree, the giant laid hold of the top of the tree where the ripest fruit was hanging, bent it down, gave it into the tailor's hand, and bade him eat. But the little tailor was much too weak to hold the tree, and when the giant let it go, it sprang back again, and the tailor was tossed into the air with it. When he had fallen down again without injury, the giant said: 'What is this? Have you not strength enough to hold the weak twig?' 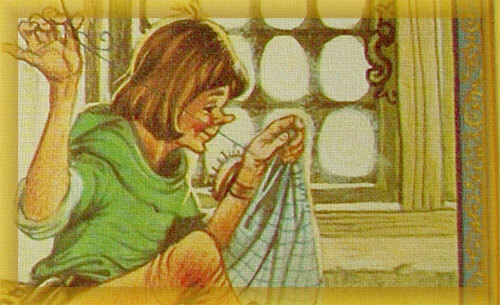 'There is no lack of strength,' answered the little tailor. 'Do you think that could be anything to a man who has struck down seven at one blow? I leapt over the tree because the huntsmen are shooting down there in the thicket. Jump as I did, if you can do it.' The giant made the attempt but he could not get over the tree, and remained hanging in the branches, so that in this also the tailor kept the upper hand. The giant said: 'If you are such a valiant fellow, come with me into our cavern and spend the night with us.' The little tailor was willing, and followed him. When they went into the cave, other giants were sitting there by the fire, and each of them had a roasted sheep in his hand and was eating it. The little tailor looked round and thought: 'It is much more spacious here than in my workshop.' The giant showed him a bed, and said he was to lie down in it and sleep. The bed, however, was too big for the little tailor; he did not lie down in it, but crept into a corner. When it was midnight, and the giant thought that the little tailor was lying in a sound sleep, he got up, took a great iron bar, cut through the bed with one blow, and thought he had finished off the grasshopper for good. With the earliest dawn the giants went into the forest, and had quite forgotten the little tailor, when all at once he walked up to them quite merrily and boldly. The giants were terrified, they were afraid that he would strike them all dead, and ran away in a great hurry. The little tailor went onwards, always following his own pointed nose. After he had walked for a long time, he came to the courtyard of a royal palace, and as he felt weary, he lay down on the grass and fell asleep. Whilst he lay there, the people came and inspected him on all sides, and read on his girdle: 'Seven at one stroke.' 'Ah!' said they, 'what does the great warrior want here in the midst of peace? He must be a mighty lord.' They went and announced him to the king, and gave it as their opinion that if war should break out, this would be a weighty and useful man who ought on no account to be allowed to depart. The counsel pleased the king, and he sent one of his courtiers to the little tailor to offer him military service when he awoke. The ambassador remained standing by the sleeper, waited until he stretched his limbs and opened his eyes, and then conveyed to him this proposal. 'For this very reason have I come here,' the tailor replied, 'I am ready to enter the king's service.' He was therefore honourably received, and a special dwelling was assigned him. The little tailor demanded of the king the promised reward; he, however, repented of his promise, and again bethought himself how he could get rid of the hero. 'Before you receive my daughter, and the half of my kingdom,' said he to him, 'you must perform one more heroic deed. In the forest roams a unicorn which does great harm, and you must catch it first.' 'I fear one unicorn still less than two giants. Seven at one blow, is my kind of affair.' He took a rope and an axe with him, went forth into the forest, and again bade those who were sent with him to wait outside. He had not long to seek. The unicorn soon came towards him, and rushed directly on the tailor, as if it would gore him with its horn without more ado. 'Softly, softly; it can't be done as quickly as that,' said he, and stood still and waited until the animal was quite close, and then sprang nimbly behind the tree. The unicorn ran against the tree with all its strength, and stuck its horn so fast in the trunk that it had not the strength enough to draw it out again, and thus it was caught. 'Now, I have got the bird,' said the tailor, and came out from behind the tree and put the rope round its neck, and then with his axe he hewed the horn out of the tree, and when all was ready he led the beast away and took it to the king. The king still would not give him the promised reward, and made a third demand. Before the wedding the tailor was to catch him a wild boar that made great havoc in the forest, and the huntsmen should give him their help. 'Willingly,' said the tailor, 'that is child's play!' He did not take the huntsmen with him into the forest, and they were well pleased that he did not, for the wild boar had several times received them in such a manner that they had no inclination to lie in wait for him. When the boar perceived the tailor, it ran on him with foaming mouth and whetted tusks, and was about to throw him to the ground, but the hero fled and sprang into a chapel which was near and up to the window at once, and in one bound out again. The boar ran after him, but the tailor ran round outside and shut the door behind it, and then the raging beast, which was much too heavy and awkward to leap out of the window, was caught. The little tailor called the huntsmen thither that they might see the prisoner with their own eyes. The hero, however, went to the king, who was now, whether he liked it or not, obliged to keep his promise, and gave his daughter and the half of his kingdom. Had he known that it was no warlike hero, but a little tailor who was standing before him, it would have gone to his heart still more than it did. The wedding was held with great magnificence and small joy, and out of a tailor a king was made. After some time the young queen heard her husband say in his dreams at night: 'Boy, make me the doublet, and patch the pantaloons, or else I will rap the yard-measure over your ears.' Then she discovered in what state of life the young lord had been born, and next morning complained of her wrongs to her father, and begged him to help her to get rid of her husband, who was nothing else but a tailor. The king comforted her and said: 'Leave your bedroom door open this night, and my servants shall stand outside, and when he has fallen asleep shall go in, bind him, and take him on board a ship which shall carry him into the wide world.' The woman was satisfied with this; but the king's armour-bearer, who had heard all, was friendly with the young lord, and informed him of the whole plot. 'I'll put a screw into that business,' said the little tailor. At night he went to bed with his wife at the usual time, and when she thought that he had fallen asleep, she got up, opened the door, and then lay down again. The little tailor, who was only pretending to be asleep, began to cry out in a clear voice: 'Boy, make me the doublet and patch me the pantaloons, or I will rap the yard-measure over your ears. I smote seven at one blow. I killed two giants, I brought away one unicorn, and caught a wild boar, and am I to fear those who are standing outside the room.' When these men heard the tailor speaking thus, they were overcome by a great dread, and ran as if the wild huntsman were behind them, and none of them would venture anything further against him. So the little tailor was and remained a king to the end of his life.